The gecko world comprises more than 400 species of lizards. Many species are frequently seen as pets, such as leopard geckos (Eublepharis macularius) and Madagascar ocelot geckos (Paroedura pictus). If you're bringing a baby gecko into your life, a little preparatory knowledge regarding these wee reptiles can go a long way. 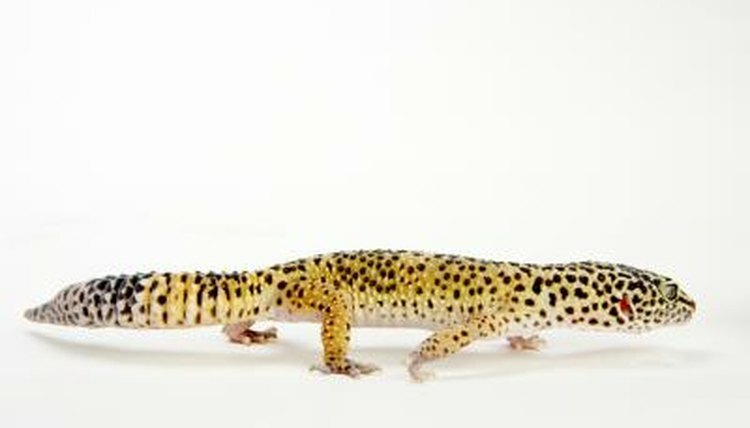 Leopard gecko embryos that initially encounter warm temperatures tend to produce males. Embryos that went through decreased and increased temperatures alike, whether 79 degrees or 93 degrees, are more likely to produce females. Temperature is the predominant influence for gender within Eublepharidae geckos. Gecko parents typically don't look after their youngsters. Once the mothers deposit the eggs, they generally leave them behind, often after diligently covering them up. Baby geckos develop very quickly. Their diets often contain lots of insects such as locusts and crickets. They also thrive on fresh fruit, such as chopped up mango. Human baby food in fruit flavors such as apricot often work well, too. Plan your baby gecko's menu by consulting your vet. Never feed the little one anything unless you have vet approval. Geckos often do well when provided nutritional supplementation. Powders that contain both vitamin D3 and calcium are commonly used. Adult geckos typically require them at least once weekly, and the youngsters typically twice as often. Always consult a reptile veterinarian for approval before giving your lizard any dietary supplements. Baby geckos have a distinct style of communication. The little guys can be rather skittish and fearful at first, and they tend to hiss noisily when they're apprehensive. They rely on their tails for lots of key body language. When they're enthusiastic about spotting a person or fellow lizard, they often show it by swaying their tails back and forth, sort of like dogs do. Baby geckos in the wild frequently do this also when they're on the lookout for food. During intense enthusiasm, the tail motion is often so speedy that it produces a conspicuous hum. Molting is normal for baby geckos. When their little physiques outgrow their scales, all of their old skin comes off. If you want to make sure that your baby gecko is indeed growing at a proper rate, keep track of his shedding schedule. If you notice that he's shedding once every two weeks or so, things are looking good. Using a ruler to track your baby gecko's growth process often can be helpful. Mature geckos regularly shed, too. Zero appetite often indicates health problems in many animals, including baby geckos. If your baby gecko seems to have no interest in eating his meals, get him an appointment with a herpetological veterinarian as soon as possible. Never try to force the tiny creature to eat anything, as that could lead to severe havoc with his sensitive tissues.